Many inventors ask us what the “invention timeline” is. The invention process has several steps that inventors typically follow. We have posted an Inventions Timeline to help inventors on the Neustel Law Offices website (www.patent-ideas.com). The U.S. Patent & Trademark Office announced a pilot program to accelerate the patent examination of “green” technology patent applications. The intention of the pilot program is to accelerate the development and deployment of green technology. It is expected that the patent applications entered into the pilot program will be examined approximately one year earlier. It currently takes approximately 30 months for a first office action and approximately 40 months for a final decision on green technology patent applications. You can read the USPTO Press Release on Accelerating Green Technology Patent Applications. 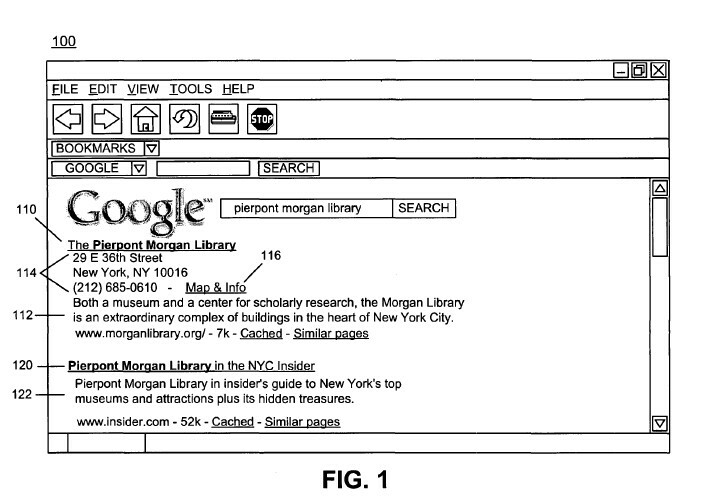 On November 24, 2009, Google was awarded U.S. Patent No. 7,624,101 titled “Enhanced Search Results.” This patent is for the Google search technology you see today when searching for a business where the results includes a phone number, address and a map for the business. Below is the Abstract and Figure 1 from the patent. A method includes receiving a search query from a user and generating search results based on the search query. The method may also include providing the search results and information identifYing at least one ofa telephone number or an address associated with a first one of the search results to the user. The method may further include providing a link to a map associated with at least the first search result to the user.